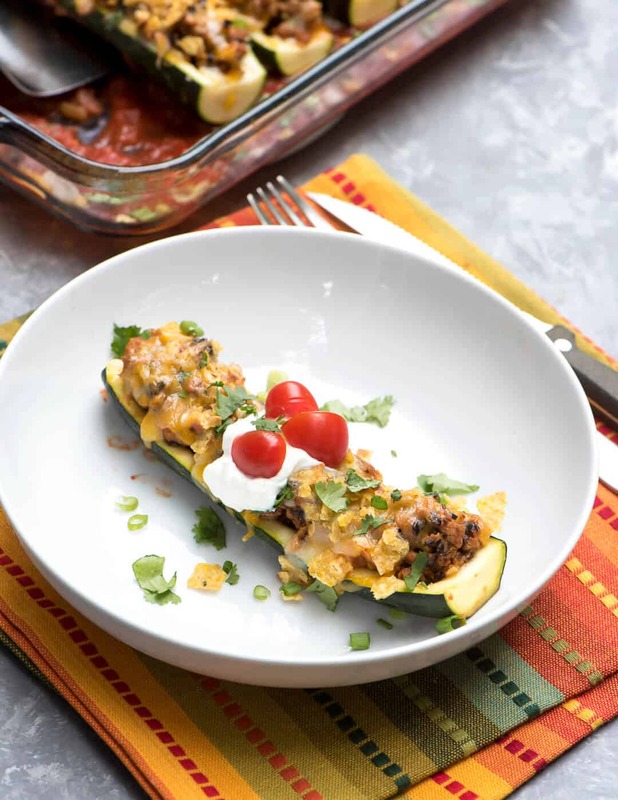 These Taco Stuffed Zucchini Boats are one of the most delicious things you can do with your summer zucchini. 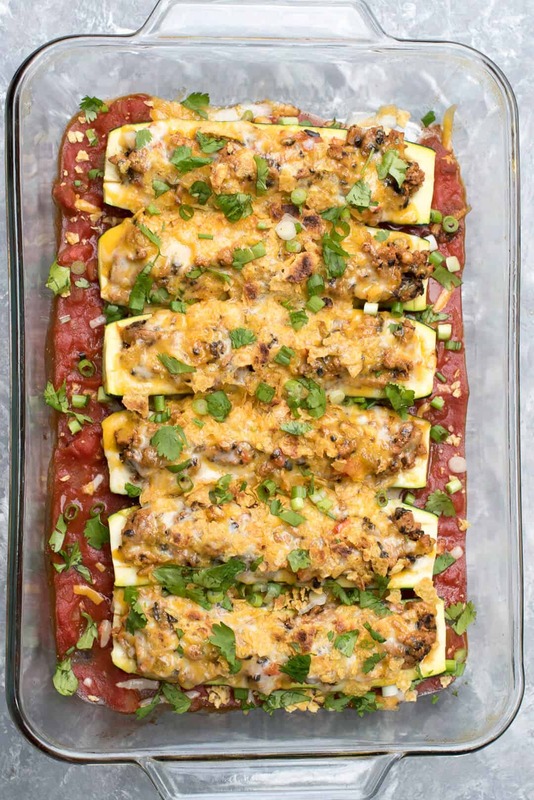 A wholesome, low-carb dinner idea the whole family will love. If you told me when I was a kid how much I’d love zucchini today, I’d never have believed it. Not for a second. Little did I know how important this incredibly versatile veggie would become to me. 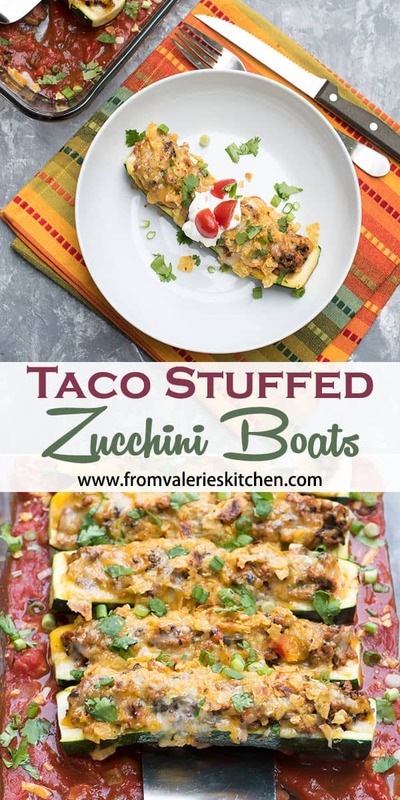 Last year I published my first foray into stuffed zucchini and those Italian Stuffed Zucchini Boats quickly became the most popular recipe with my readers since the beginning of this blog. Many of you reading this now may have stumbled upon this blog because of those boats. That recipe has been viewed well over 1 million times and they’ve been made in so many kitchens. I’ve been sent photos of your end results and have received more warm and wonderful comments than I can count. Each and every message has warmed my heart. Especially from those of you who’ve told me the recipe has convinced your young ones who thought they despised zucchini that it’s actually quite tasty. This is big for me. Getting those young ones to become veggie fans at a young age will pave their path to a veggie-filled future. The key is introduce them in a way that is familiar to something they’ve eaten and loved in the past. Last time I went the Italian route and this time I went with TACOS! The filling is a mixture of lean ground turkey, onion, red bell pepper, garlic, diced green chiles, olives, some salsa and tomato sauce and my Homemade Taco Seasoning Mix. 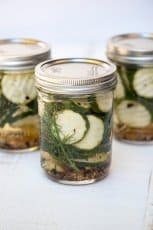 I wrote this recipe assuming that folks will (and should!) 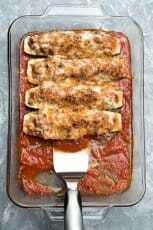 modify it to suit their taste so take a look at my tips below for making this dish your own. 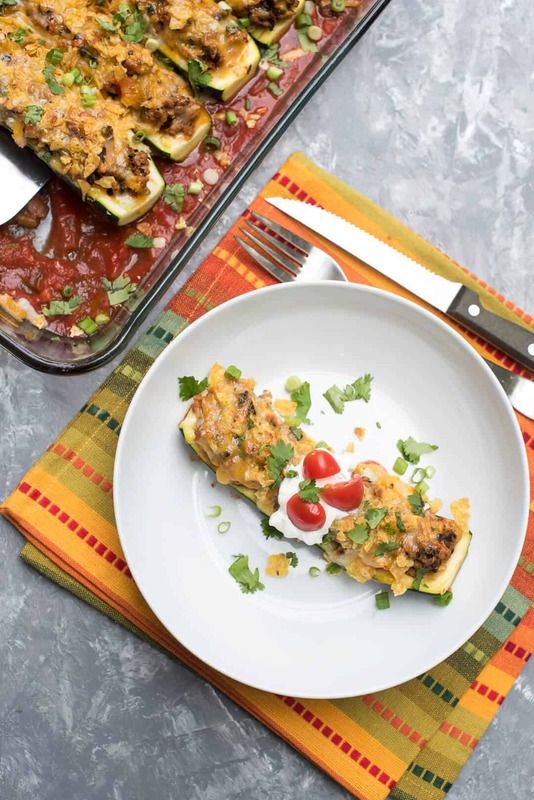 The zucchini rests on a simple mixture of salsa combined with tomato sauce. 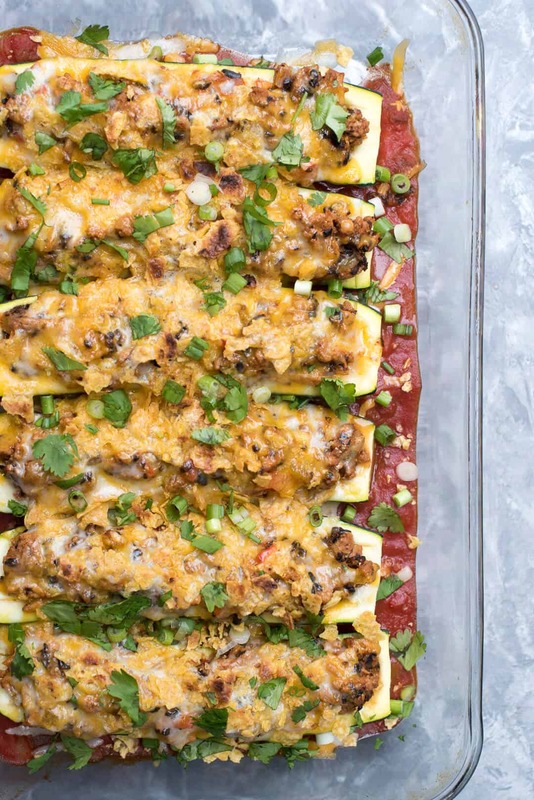 Melted cheddar and Jack cheese make it savory and crushed tortilla chips sprinkled over the top add some great texture and that irresistible corn flavor. Be sure to watch the video in this post for some tricks on hollowing out the zucchini and to see the entire process in action. You can garnish the individual servings with a variety of taco toppings – I went with green onion, cilantro, sour cream (always! ), and some diced cherry tomatoes for a pop of color. 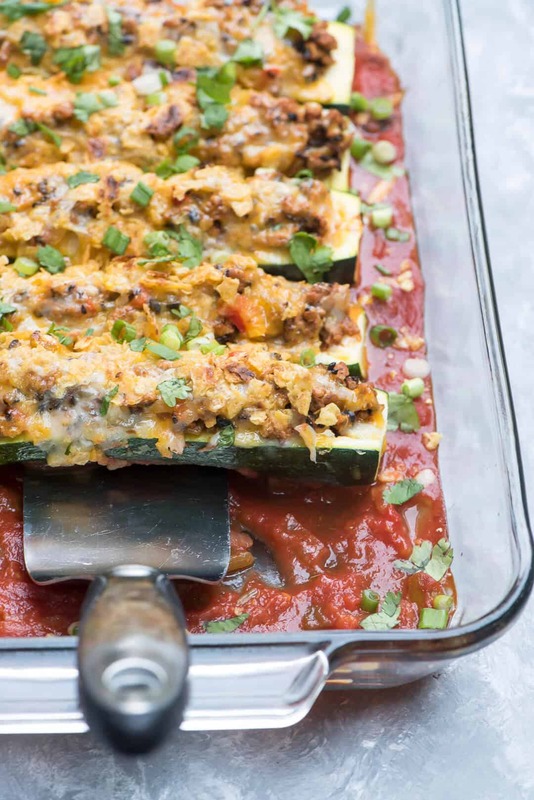 Look for zucchini that are uniformly-sized so that they will require the same amount of time in the oven to soften. The first step in creating this recipe is to slice your zucchini and hollow it out. Watch the video for my method to ensure good lookin’ boats. Don’t toss the zucchini flesh. Set it aside to add back to the filling mixture. The next step is to bake the hollowed out zucchini for about 20 minutes in a dish filled with a bit of water and covered in foil (see the video). This step is crucial to the success of this recipe so please don’t be tempted to skip it. Nobody likes soggy zucchini and other methods like boiling them in a big pot of water can lead to this. The oven method will soften them a little bit so that when you add the filling, you only need to bake them a short time for crisp-tender perfection. Set your timer and test them with the tip of a sharp knife. When you can easily pierce them, they’re ready to come out and be filled. 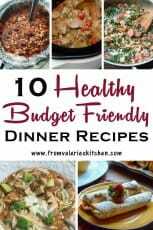 These are delicious with both lean ground turkey OR beef. 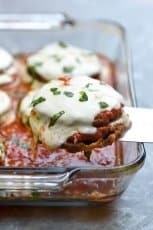 We’re ground turkey lovers here so I opted for that in the boats you see pictured in this post. Feel free to substitute any veggies you love. Mushrooms and corn would both be wonderful additions. This recipe makes enough filling for more than 6 boats. This is intentional and although not pictured here, I spoon the extra filling around the filled zucchini boats before I bake them. This way my meat-lovers can spoon up some of the extra filling and everyone is happy. You can also use it to fill a few more boats or freeze it to use another day. Trying to lighten up? Reduce the cheese in half and they will still be wonderful. Let everyone add their toppings of choice – cilantro, green onion, more crushed tortilla chips, tomatoes, avocado, hot sauce. I hope you try them and love them as much as we do. 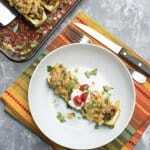 More delicious zucchini recipes to try. 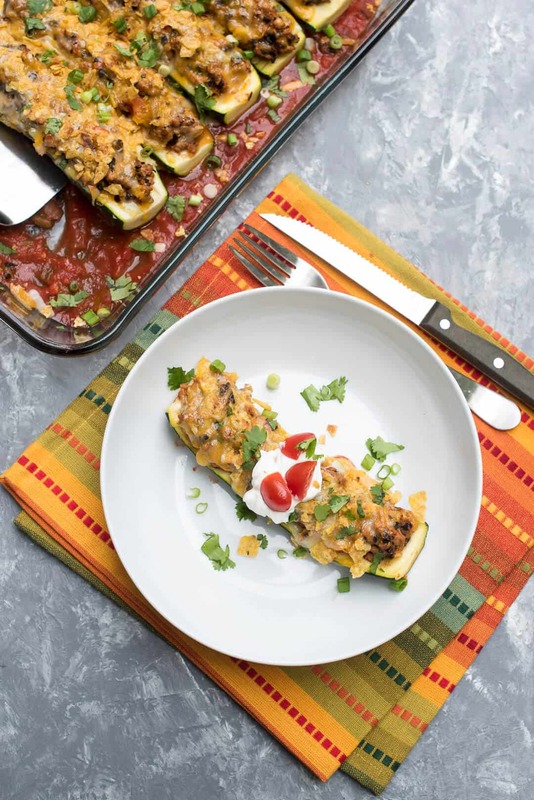 These Taco Stuffed Zucchini Boats are one of the most delicious things you can do with your summer zucchini. A wholesome, family-friendly dinner idea. Combine salsa and tomato sauce in a bowl. Measure out 1 cup and reserve for later. Meanwhile, add olive oil to a 12" skillet and place over MEDIUM heat. Add turkey (or beef), onion, bell pepper, and garlic to the skillet. Cook, stirring to break up the ground meat as it cooks. Continue to cook and stir until meat is thoroughly cooked and veggies have softened. Drain off as much grease as possible and return the skillet to the heat. Add the chopped zucchini flesh, diced green chiles, olives, salsa mixture (reserve 1 cup for later), taco seasoning, fresh ground black pepper, and crushed red pepper. Stir well to combine. Bring to a boil, then reduce heat and allow to simmer over low heat for about 15 minutes. Remove partially cooked zucchini from baking dish and pour off water. 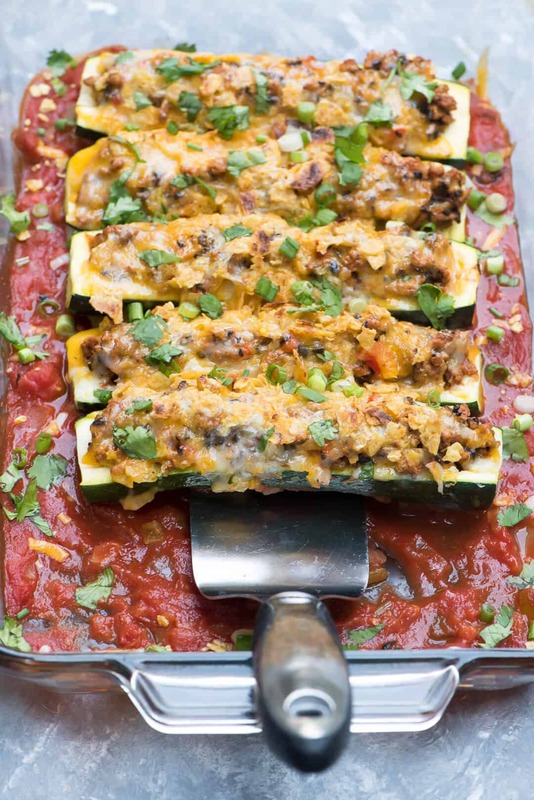 Pour the 1 cup of reserved salsa mixture into the empty baking dish and place zucchini boats on top of the sauce. 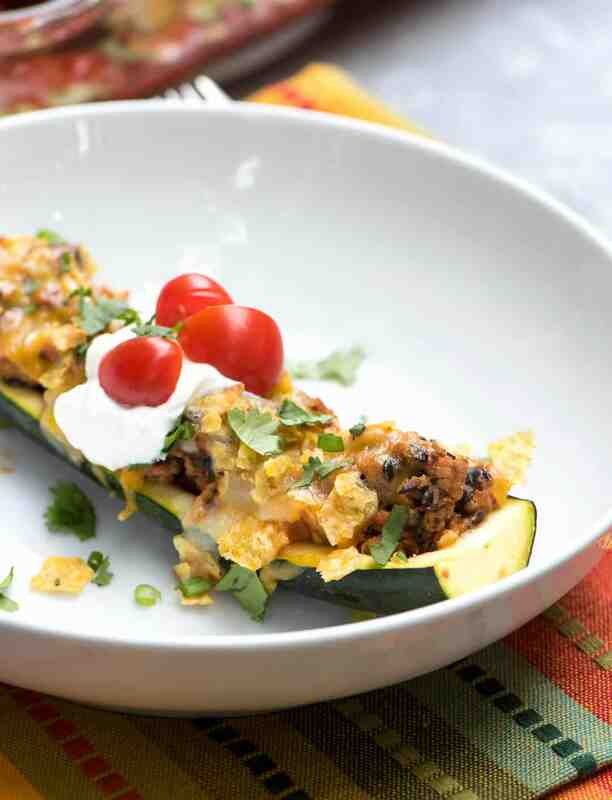 Remove foil and sprinkle zucchini boats with cheese and crushed tortilla chips. Place dish in oven, watching closely, and cook for just a couple of minutes until cheese has melted and tortilla chips are golden brown. Sprinkle with chopped cilantro and green onion and serve. Top individual servings with sour cream, chopped tomatoes, and additional crushed tortilla chips. Nutritional information was calculated based on using lean ground turkey.